Mud balls: how do they work? 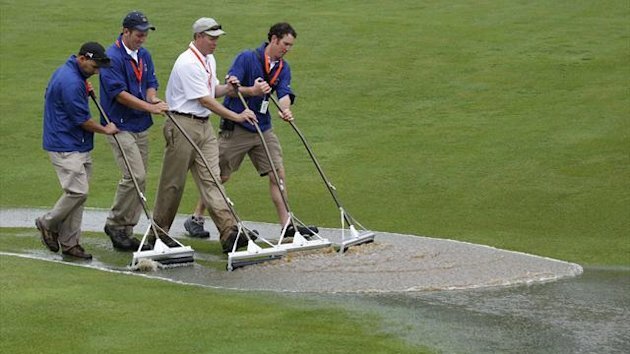 Merion’s green staff fighting an uphill battle. With Merion having weathered somewhere in the region of 6.5 inches of rain over the last week or so, “mud balls” — balls that have accumulated what scientiests refer to as “a splodge” of mud on landing, leaving their stewards with all sorts of tricky arithmetic and guesswork to conduct — could play a big part in determining the tournament’s outcome. But how do they work, exactly? And is it possible to turn the silty stuff to your advantage? Golf Digest’s Mike Strachura went in search of answers and turned up an interesting blog post. Rock Ishii, head of Nike’s golf ball research, is the man to talk to, apparently. There is a caveat, though. A pretty sizeable one, in fact.